Sunway, the package holiday specialists, have teamed up with GCN to offer one lucky reader the chance to win a fabulous seven-night Mediterranean cruise for two! Competitions 24 July, 2018 . Written by Peter Dunne. Feeling lucky? 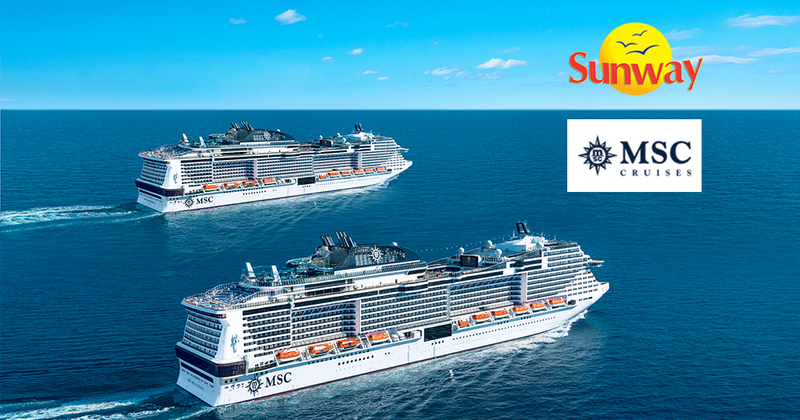 Then Sunway, the package holiday specialists, have a dream Mediterranean Cruise up for grabs! The lucky winning pair will be flown to sunny Barcelona and pampered from the moment they step aboard the magnificent ship. Feeling peckish? Start the day with an espresso bar laden with freshly-baked pastries. In the evenings, there’ll be a mouth watering range of fine dining experiences to choose from. For those looking to relax tired bodies and minds, lounge on the luxurious sun deck, or better yet, indulge yourself at the Aurea Spa, which boasts a variety of pampering treatments, including hot stone massage, Turkish baths and special couples treatments. For the more active reveller, take the plunge and stay refreshed at the Aqua Pool Complex, or get a full work out in the state of the art gym before taking a lap of the running track, fee applies. Find a bargain at a host of chic boutiques and duty-free shops, and when you’re done, why not get in a round of mini-golf followed by the unique experience of a 4D cinema screening! Finish up the evening in style at one of the lounge bars, hosting a range of live music and entertainment events. All this before you step off the ship! MSC have recently relaunched their new ship, the MSC Seaview. This is the second of two identical ships in the Seaside generation. MSC Seaview will bring guests and the sea closer, with special design elements that make the most of the warmer weather. Guests will be able to spend time outdoors eating, drinking and relaxing in the Mediterranean sunshine with some of the best sea views in the world. Guests will also enjoy an increased number of balcony cabins, sea views and public areas, wth every element carefully planned to make the most of the sea and the sunshine. For those looking for a unique and relaxing holiday, Sunway are the expert travel agent and cruise specialists, offering a fantastic selection of itineraries worldwide. Visit Europe and the Mediterranean, Alaska, Canada or the Mexican Riviera in comfort. Take in Dubai, Abu Dhabi and the Arabian Gulf while relaxing in luxurious surroundings. With a range of cruises to suit every person, family and budget, Sunway is your first port of call. To be in with a chance of winning simply follow this link – www.sunway.ie/GCN. Closing date is August 20! 24 July, 2018 . Written by Peter Dunne.